Yeah, we get it, we give you all these great food challenges, tell you about all the great places to go out and eat and drink and have a great time and expect you to stay skinny. We'll go ahead and make it up to you right now with just a few helpful words on how to enjoy Vegas and still be able to fit into those skinny jeans you packed. Yes boys, we are talking to you, too! MGM Grand: There's a $25 resort fee when you stay here which you're going to have to pay anyways, so you might as well get your use of everything you're paying for. 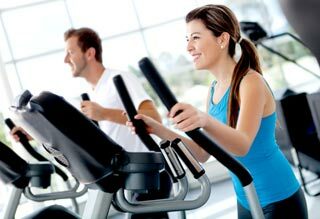 Included in this fee is the use of the health club and the fitness center. After a full work out, take a well-deserved break and relax in the steam room or sauna! Oh, you have a dinner date? Well, there is nothing better than fitting in a good work out then getting all glammed up for your fun night out. On top of that, there is a beautiful pool to fit in some more relaxing workouts or just a chance to float and show off that healthy body of yours! Palazzo Hotel/Venetian Hotel: They share their gym and the Canyon Ranch Spa, but if you're looking for a fun activity that doesn't involve a boring treadmill, they've got an indoor rock-climbing wall! All the treadmills have TVs installed right in there! How's that for fancy? If you need that extra motivation, they also have yoga and spinning classes that provides a much more fun environment than a normal gym. Take a walking tour of Caesars Palace. Yeah, you'll probably get lost, but who doesn't like to wander and simply enjoy the sites? Rome around the pool or the Forum shops, and make a couple of trips up and down the Spanish steps out front for a little extra work out. See the Grand Canyon. Put away the 6" heels and bust out those sneakers that haven't made it out of the suitcase yet. Make a day of it on one of the Grand Canyon/Hoover Dam tours and you'll earn every margarita you indulge in that night. Take a Dance Class. Leave the two-step for Texas; Here in Vegas, we go to the Night School 4 Girls. Working out in high heels is completely acceptable in this case, and you'll have more than just a hotter body to take home to your man that night! Do the dances you know best. Hit all the best nightclubs and show off your best moves. Maybe not the moves you learned at Night School 4 Girls though... We recommend dance moves like these. Tip #3: Dine and Dash. Like, in the sense that you eat, but also run! We definitely do not recommend running out on your bill. OK, here are some of our favorite Vegas restaurants known for their healthier options small portions. For fancy fixings try Sage at the Aria or Picasso at the Bellagio. They're a bit pricier but have lots of healthy options and smaller portions. And by small we mean the appropriate size, not a super sized portion that so many of us are used to. Eat Sushi. It's healthier than fried food and hot dogs, even though hot dogs are delicious. If you must eat at a Buffet, the Spice Market Buffet has the freshest food and there are lots of options. Duh, it's a buffet, but lots of health(ier) options! Drinks: Whiskey and vodka. The less ingredients the better. SERIOUSLY. If you were drinking Jack and Cokes all night last night, trust us when we tell you that it wasn't the Jack that's made you bloated in the morning.